'The Grandeur of Khalsa' offers a life-altering perspective of the greatness of Guru Gobind Singh Ji. 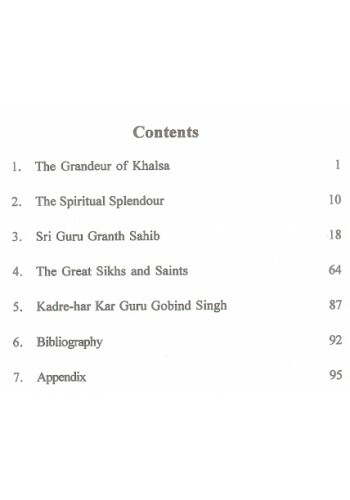 The book deals with some of the most significant aspects of Khalsa and provides a rich, in depth study and proper evaluation of various dimensions of Sikh spirituality and sublimity. It is a presentation in simple language for the benefit of the new generation providing a comprehensive understanding of the greatness and grandeur of Khalsa. The need of the hour today is to remember what has been bequeathed to us and follow it as ordained by the great Gurus. 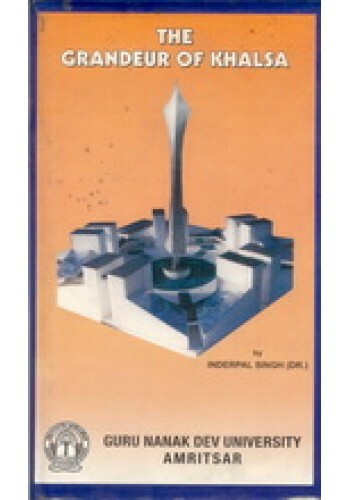 It is hoped that this book will be of good use to students and researchers in the field of Sikh studies. I must compliment and congratulate Dr Inder Pal Singh for writing the book 'The Grandeur of Khalsa' in simple language for the benefit of the new generation. Guru Gobind Singh Ji's message of universal brotherhood and spiritual splendour of the Khalsa has been beautifully highlighted in this book. It is a befitting tribute to the Guru when we are celebrating the Tercentenary of the birth of Khalsa all over the country. The writer has also chosen to write about the great sikhs and saints and the message of Gurbani in Adi Granth. The last Chapter is a personal expression about the great Guru who was,indeed, a rare blend of Bhakti and Shakti. The articles in this book provide a comprehensive understanding of the salient features of the Khalsa in world perspective. 'The Grandeur of Khalsa' in fact, brings into focus the message of Guru Gobind Singh Ji in respect of his humanistic concerns both at the spiritual and temporal level. I do hope this book will prove to be indispensable for all those who are interested in the Sikh thought as propounded by Guru Gobind Singh Ji and Guru Granth Sahib. The Grandeur of Khalsa lies in its spiritual strength which guides and helps to serve the humanity by the grace of God. The great Guru transformed the timid people into confident and brave soldiers who could fight the forces of oppression for the sake of dharma. It is thus a humble tribute to the Great Master Guru Gobind Singh Ji, the Creator of Khalsa. I bow to the memory of Bhai Vir Singh Ji whose inspirational words, heard at his feet, as a child, still guide me. My fathers S.Sohel Singh Ji was a living example of a devoted sikh who loved to study the Sikh literature which brought me closer to Sikh scriptures and Sikh history books at an early age. Later in life, my loving wife late Bibi Anuwant Kaur was a great source of strength. She was a committed and devoted Sikh who loved Kirtan and Naam. These influences have greatly worked with me to write this book. It has been my earnest desire to write, more particularly for the new educated young generations of boys and girls about the splendour of Sikh spirituality, Sikh culture and the Grandeur of Khalsa. I have, therefore, highlighted some wonderful facets of Khalsa and Gurbani. I am sure the book will convey the right message. I am highly grateful to Lt. Gen. (Retd.) B.K.N. Chhiber, the Governor of Punjab for very kindly writing the Foreword of the book. I must heartily thank my esteemed Vice-Chancellor Dr H.S. Soch for his sincere support all through this venture. I may also record my appreciation for my son S. H.P. Singh, I.P.S. and my daughter Prof. Chandip Kaur Who have been sharing with me the thinking of the present - day youth. 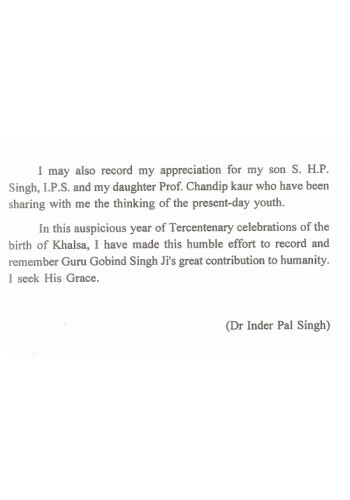 In this auspicious year of Tercentenary celebrations of the birth of Khalsa, I have made this humble effort to record and remember Guru Gobind Singh Ji's great contribution to humanity. I seek His Grace. Dr Inder Pal Singh, ProVice Chancellor, Guru Nanak Dev University, Amritsar is a senior academician with a professional standing of over four decades. While his basic discipline is Education, he has been a keen student of Sikh Studies. He is accredited as Shiromani Lekhak of the State having written, edited and compiled over thirty books in Punjabi, English and Hindi in diverse subjects like education, religion children literature etc. He is widely travelled all over the world and has been a member of various state, national and international level bodies. 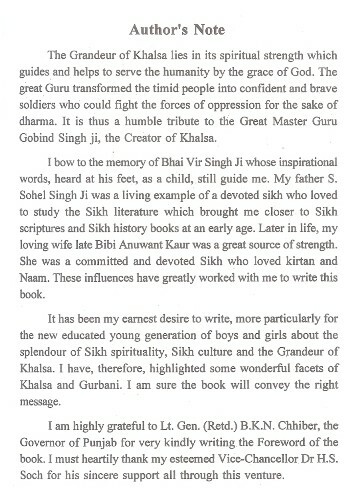 Foreword To The Book 'Guru Gobind Singh Prophet of Peace' By Dr. K. S. Raju Foreword By ..
Foreword To The Book 'Noble & Brave Sikh Women' By Principal Sawan Singh Principal Sawa..
From The Backcover Of 'Birth Of The Khalsa' By Surinder Singh Johar Guru Gobind Singh w..